Some city neighborhoods are more equal than others — a lot more equal. It might help partly explain why some neighborhoods get an abundance of attention from city hall, and others not so much. The city’s diversity, according to the city charter, is to be represented in appointments to city boards and commissions. The city requires a report on race, gender, ethnic heritage, disability and communities of interest and neighborhoods. But the diversity of the city’s neighborhoods gets overlooked when the city examines diversity. District 2, Gavin Newsom’s neighborhood when he was appointed to the Board and where he has had his businesses, ranked at the top with 57 appointees. Supervisor Carmen Chu represents a district with only seven city appointed officials. While neighborhood diversity is likely as important to most San Franciscans as other factors, it also is important for other reasons. It infuses government with the most localized issues, from blight along a commercial corridor to the condition of parks in a neighborhood. It gets to the nuts and bolts of whether city services are being delivered to all residents. Serving on city boards and commissions is also a proving ground that lets both the community and the officeholder see performance in city government. Mayor Newsom began his career as a city commissioner, on the Parking Commission, and current Supervisor David Campos was elected while serving as a Police Commissioner. It’s no prerequisite, of course, as Supervisor Mark Farrell proved when it admitted that the first time he walked into the Board of Supervisors chambers was when he was elected. With supervisors elected by district, it becomes more important that district residents gain experience in city government, and that can include serving on a city commission. CitiReport was able to identify residences for 236 of 313 city commissioners and board members by using the city’s voter registration records. The 77 commissioners not identified from voting records could be for a number of reasons – some commissions, such as Asian Art or the Youth Commission, don’t require voter registration. Some names are so similar that it was not possible to identify which one was the commissioner on our list. And some may have been missed by the Elections Department or actually failed to vote. The Department head list we used has 60 city departments, but department heads are not required to live in the city. We included those we found on the city voter rolls. That brought our total to 284 appointees. CitiReport’s survey, district by district, is mapped and also can be accessed by clicking on the link for each district below. The list includes both the name of the commissioner and the commission or board where he or she serves. When you look at your own district, check out whether your district includes commissioners on any of the city’s “power” commissions like Planning or commissions that have a strong impact on neighborhood services from libraries to parks to police. A one-sentence description tells you which department heads live in that district as well. District 4 (Chu) – 7 appointees, including Assessor Ting, Elections Director Arntz and Ethics Director St. Croix. District 5 (Mirkarimi) — 29 appointees, including Recreation and Parks Director Ginsberg, Housing Authority Director Alvarez, and Public Works Director Resikin. District 6 (Kim) – 16 appointees, including Human Rights Director Sparks. District 7 (Elsbernd)– 45 appointees, including Public Defender Adachi, Police Chief Suhr and Fire Chief Hayes White. 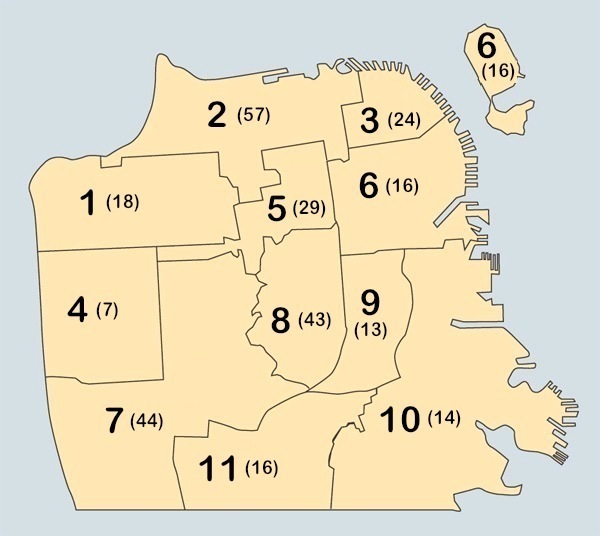 District 8 (Wiener) — 43 officials, including Mayor Ed Lee, Treasurer Cisneros, PUC Director Harrington, Treasure Island Director Saez, Controller Rosenfeld, Housing Director Shoemaker, Workforce Director Matz, Disability Director Mizner, Health Services Director Dodd. District 11 (Avalos) – 16 appointees, including Civil Service Executive Secretary Sanchez.